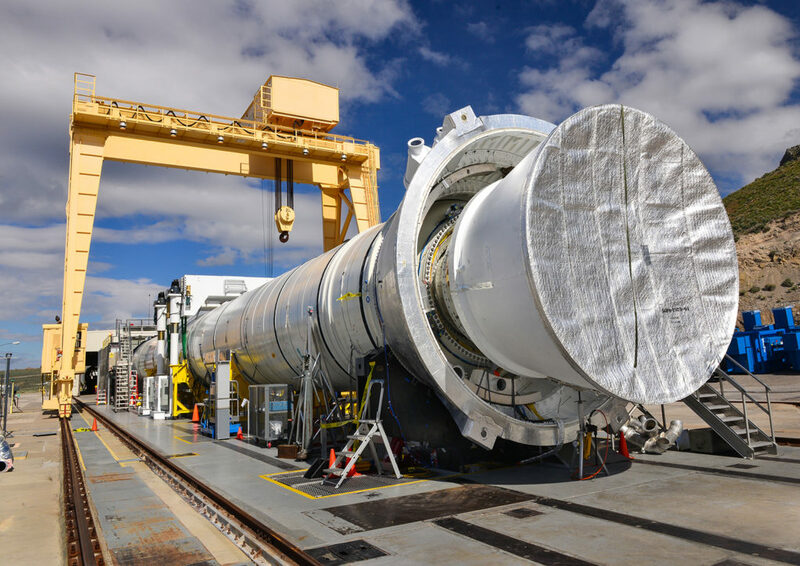 May 10, 2016 – Orbital ATK, in partnership with NASA, has completed installing the second Space Launch System (SLS) booster qualification motor, QM-2, in a specialized test stand in Utah in preparation for a June 28 static-fire test. QM-2 is the second of two Orbital ATK-developed motors to support qualification of the boosters for NASA’s SLS, which is a heavy-lift rocket designed to enable deep space exploration missions. The first qualification motor, QM-1, completed a successful test last spring. While last year’s QM-1 test validated motor performance at the upper end of the propellant temperature range, Orbital ATK personnel are cooling QM-2 to 40 degrees Fahrenheit to test its lower temperature capabilities against the required temperature range. Lying horizontally in the test stand, the motor is 154 feet in length and 12 feet in diameter. When fired, QM-2 will produce 3.6 million pounds of maximum thrust. Orbital ATK and NASA will use measurements from more than 530 data channels to evaluate motor performance, acoustics, motor vibrations, nozzle modifications, insulation upgrades, Booster Separation Motor structural dynamic response and nozzle vectoring parameters. The full-scale motor test will further improve the safety, technology and knowledge of solid rocket motors. The SLS five-segment motor is based on the design heritage of the flight-proven solid rocket boosters used on NASA’s Space Shuttle and incorporates new technologies and updated materials. The SLS, along with NASA’s Orion spacecraft, provides a flexible deep space exploration platform to take humans and cargo to multiple destinations across our solar system. Orion successfully experienced its first flight test in December 2014, orbiting twice around the Earth and flying as far away as 3,600 miles – more than 15 times farther than the International Space Station and farther than a human spaceflight vehicle has traveled in 40 years. The first test flight of SLS and Orion together, called Exploration Mission-1, is scheduled for 2018. EM-1 will use two of Orbital ATK’s five-segment solid rocket boosters.